The jetlag is finally better and I’ve caught up on the paperwork and have groceries back in the pantry. Now it is time to write about my adventures on my latest pilgrimage. My daughter Alexandra was invited to spend the summer with long lost cousins in Sweden. This was a dream come true from the first time she met Tom and Julie. As we were planning her adventure my mother decided it was time for me to go too. So off we went on a mother/daughter adventure to the homeland. My great-grandfather Carl Olson left Sweden at 17 to find a new home for his family. He found a beautiful farm in Minnesota that is still in the family. My mother recently sold a lot from the farm and gave me some of the proceeds for airline tickets. So my great-grandfather sent me back to Sweden 120 years after he left. As with all pilgrimages the call came and I packed my bags for the adventure. Stockholm was first on the itinerary, and a beautiful city it is. We walked the streets, visited museums, took boat rides and shopped. We went to the Royal Palace where my great- great grandfather Oscar Lindblad had been a guard. I’m sure he arranged everything because we got there just in time for a Royal Wedding. Princess Madeleine married an American and we enjoyed the pageantry. I wanted to see the countyside and where my ancestors came from so we rented a car and I bravely drove out of Stockholm south to the small town of Vadstena. I have never driven in a foreign country before but I picked an easy one for my first time. Well marked, and easy to navigate, the roads were perfect and without any billboards or trash. Sweden looks just like Minnesota or does Minnesota look just like Sweden? Since I spent my summers on the farm in Minnesota I was absolutely home. The look, the feel, the sound, the smell, it was home. 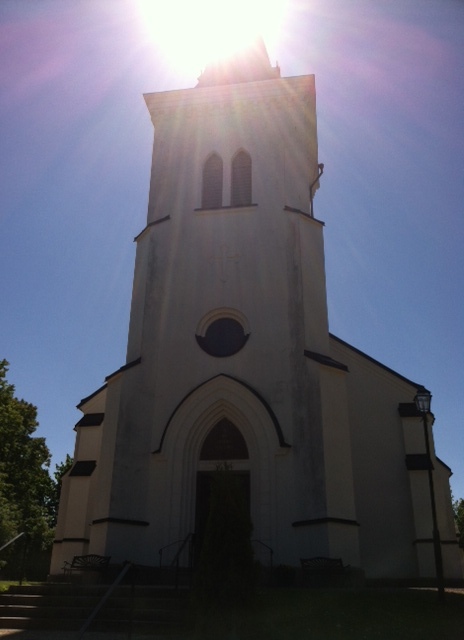 I found the little church in Carl’s village of Tollstad. He surely had been in the church as a young man. We didn’t go in because there was someone singing “The Rose” inside and we didn’t want to disturb. I was happy to be walking in the footsteps of my ancestors. We went about 20 more miles to Vadstena, a beautiful village on the shore of Lake Vattern, one of the large lakes in central Sweden. 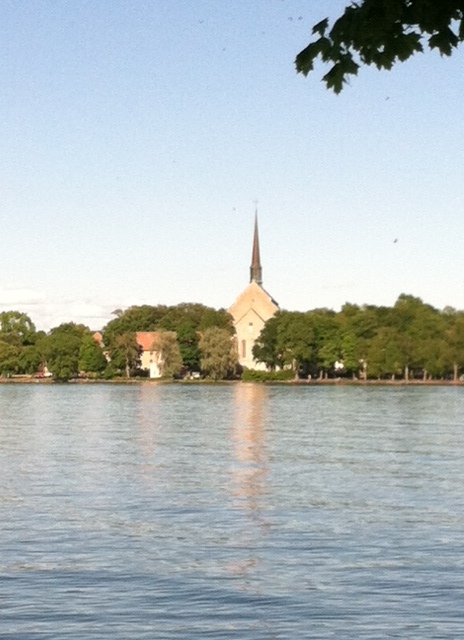 Vadstena is the home of the patron saint of Sweden, St. Bridget. Although I’m not Catholic, nothing makes me happier than to be in the company of Saints. 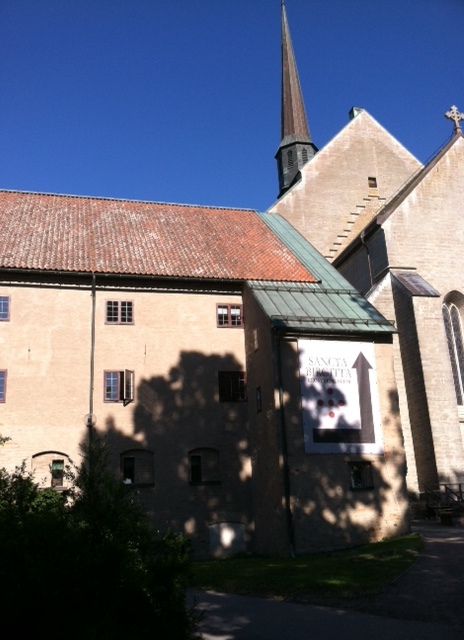 The hotel in Vadstena is actually St Bridget’s convent with parts dating back to the 1300’s. Now I’m totally happy—Abbey, convent, and saints all next to a stunning lake and after four days in a big city this country girl was so pleased with the silence. The next morning Alexandra wanted to sleep in so I went to breakfast and back to the Abbey. There was a small group in the back holding Morning Prayer. I was in the far corner listening to the unfamiliar words that I know had a very familiar meaning. The song for that morning was “Amazing Grace” sung in Swedish, the lovely voices reverberated and I needed no translation to receive the Grace myself. As they left the Abbey I was all alone with St. Bridget, a woman who had dedicated her life to God. She took many pilgrimages including Spain, Jerusalem and Rome and founded the Bridgettine Order. Her Feast Day is July 23. In the tiny Lake Eunice Cemetery in Becker County Minnesota are my ancestors, Oscar and Clara, John and Wilhelmina, Carl and Ella, they all bravely set out to find a new home and changed the path of their family forever. This entry was posted in Christianity, Journeys by theperpetualpilgrim. Bookmark the permalink.